Paul Harman is an imaginative pastel, painter who is driven by a love of the medium and a passion for self-expression through art. his works are often noted for their realism and attention to detail. His unique style and technique and his joy in painting in pastels drives him to painting beautiful landscape paintings. He enjoys using vibrant colors and balanced values to make his work an excellent choice for the discerning collector of fine art. Paul is an award winning Signature artist. Paul's painting, "Light of a New Day" recently won Best Pastel in the Plain Air Magazine's 7th Annual Salon competition. His work is represented by Seven Oaks Gallery in the Fiddler Green Plaza, 1273 Grass Valley Highway, Auburn. He can create the perfect piece from a favorite place that you love to go to, or you can commission him to paint a specific location that you love to visit. When he was a teenager, he loved drawing and painting and wanted to be an illustrator. Parental support was not there, but he continued his interest in art for his own enjoyment. Over the years he painted in water color and oils and drew many pencil and pen and ink sketches. After retirement his wife Cindy thought he should get back into art, as she knew how much he enjoyed creating it. 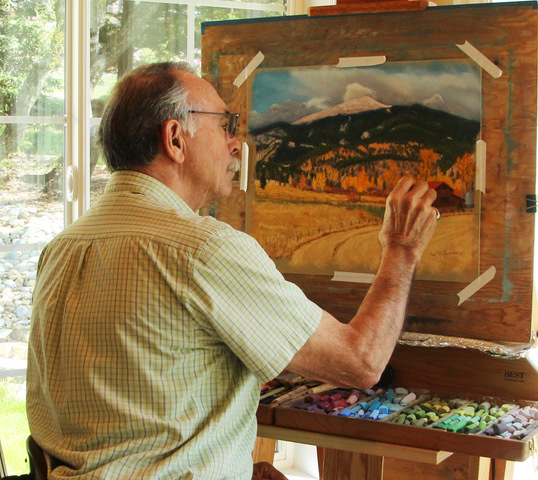 She gave him the gift of lessons with Auburn's award winning pastel artist Reif Erickson. Paul instantly fell in love with the medium, and absorbed every detail he could glean from Reif, and studied with him for a year. He credits Reif with teaching him so very much about color and values and why they were important in creating paintings with interest. He loves to visit art museums and study the work of famous landscape painters. Through his growth in the pastel medium, he has developed his own style and paints vibrant paintings of places he has visited. He enjoys being able to capture those special moments and recreate them with a painting of the scene for others to enjoy. Paul is a member artist with the Arts Councilo the Sierra Pastel Society, and the Pastel Society of the West Coast. He paints for his own enjoyment, and hopefully yours as well. He loves to capture the beautiful rural scenes around Auburn, the old barns that tell a story of ages gone by and also enjoys painting animals and birds. He hopes you are captivated by some of the beautiful scenes he paints and that his paintings will bring back a special memory of your own when you visited one of the places he has painted. He enjoys plein air painting on location. Some of his paintings were begun in sketches on location and finished in his home studio where he also uses reference photographs that captured the lighting at the time he was there.